COLOR:STORY 2019 = EXHIBIT UP RIGHT NOW. PLEASE SCROLL DOWN FOR PAST PROJECTS. Color:Story -A Community/Visual Art/Literary event - A series of collaborative exhibits through which artists Marlo Saucedo and Leslie Gaworecki collaborate to create work representing/presenting the work of authors/writers/poets. 17 Houston-area poets and authors were chosen by submission for Color:Story 2019, exhibited January 12 - March 23rd in the Gallery 200 space of The Silos on Sawyer. **Color:Story 2019 had the largest opening the Silos on Sawyer building had ever seen. ** Color:Story 2020 will include a national group of poets and writers. Leslie Gaworecki and Marlo Saucedo, Houston artists, have very different styles/methods/approaches, creating interesting flow throughout the visual exhibit, where writers’ words are a part of each piece. Local Houston-area writers submitted to be chosen for this exhibit, with help getting the word out from Writespace (located in Silver St. Studios). Writers include representatives from WITSHouston, Writespace, and Houston's reading and slam poetry scenes, and represent emerging creative writing talent, journalists and published authors. Each artwork includes the words of a single writer. 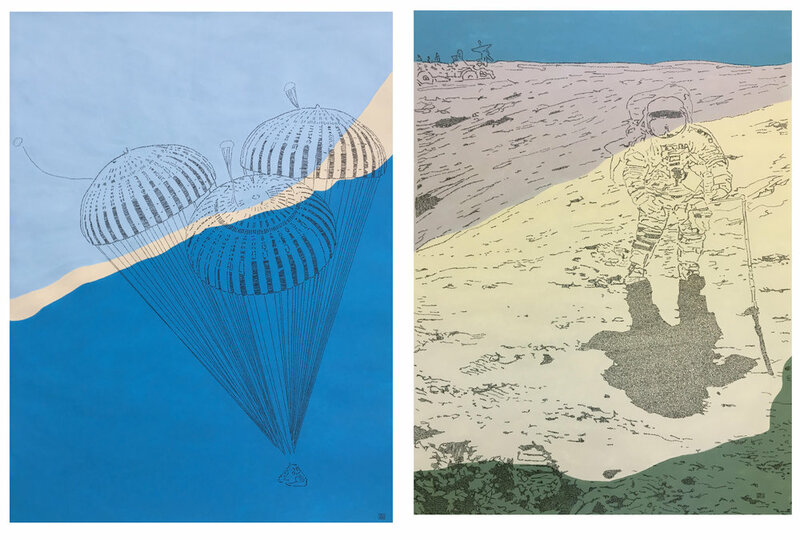 This project bridged Houston’s worlds of literary and visual art, fostering connections for better understanding differing creative disciplines. It opened Saturday, January 12th, 5-8PM with an art opening/reading/poetry slam including authors Outspoken Bean, Rachel Massey Browne, Anjola Coker, Raie Crawford, Brandon R. Dillon, Ayokunle Falomo, Catherine Gentry, Kelli Hines, Adam Holt, G. Paris Johnson, J.S. Kapral, Lisa Levy, Jake Anant Miller, Robin Reagler, Lisa Toth Salinas, Ellen Seaton, and Holly Lyn Walrath, with special guest reader Ashley Ellington Brown. To see co-exhibitor Leslie Gaworecki’s work, please visit lesliegaworecki.com. Commissioned & Completed: Two 40x30" Visual Art Narrative pieces (in ink and acrylic on paper) to be framed and installed in the lobby. Visuals from the Apollo missions. Narrative: MD Anderson’s Cancer Moon Shots Program. MD Anderson is doubling down across the board to find cures for 13 different types of cancers. Action plan, doctors involved, discoveries, and other details about the Program are written into these pieces. Commissioned & Completed: The AncesTree Project, an ink and acrylic piece on 3-foot-diameter round canvas. Neighbors in the community who attended the inaugural Woodlands Cultural and Heritage Festival wrote their memories, traditions, cultures and heritages – 260 personal stories – onto paper leaves hung on a papier mâché tree at the festival. I was commissioned to write all of those shared stories into a more permanent piece, which represents the community’s diversity entwined and growing together. The piece is installed in the Arts Council's office. Houston Methodist The Woodlands, as a new Houston Methodist hospital location, commissioned a triptych in 2017 with all of their new employees' signatures. Each of their 500 employees and staff members signed one of these trees. The hospital's mission statement and goals are woven into the remaining positive space. This triptych is installed on the third floor, facing the front lobby. Le Méredien Houston Downtown chose my work this summer for their Unlock Art™ Program. A portion of my piece Be Here Now-II was featured on Le Méredien limited edition room keys, and my work was exhibited in the lobby at 1121 Walker (77002).